My, my but don't you look swank! ....and you all look gorgeous!!! Great looking group of royals! 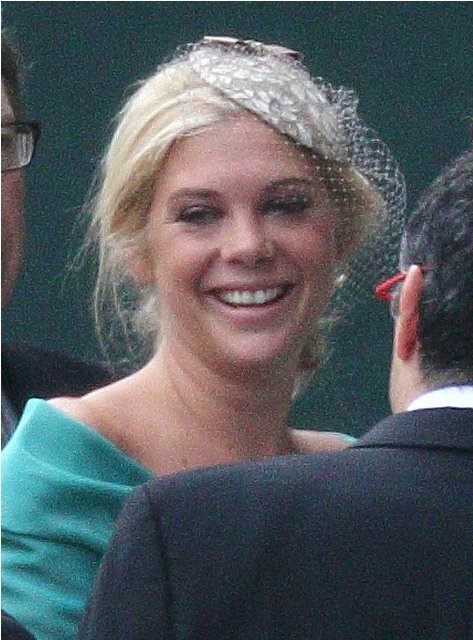 I agree that Chelsy Davy looked like she'd just rolled off the couch after a hard night on the piss. The poor taste exhibited by Fergie's daughters really should not have surprised me. As someone else has suggested, perhaps it was her revenge for not being invited. Obviously their father has no taste or else he would not have let them out the door. Love the Queen, but she looked like a canary. Oh yes, I did watch the wedding if you couldn't tell. But I didn't have any Eton Mess! I can't understand how Beatrice's hat is staying on! It's a truly remarkable feat in millinery engineering! Don't you all look so classy! I have to say, both Princess Beatrice and Eugenie wore the most awful hats! Can you please do my hair and make up Friday arvo? You see, I have this thing Friday night, and I know this lady who is totally going to outshine me based on her latest pic. So, if you could do my entire face/head first - then I shall ply you with craploads (official unit of measurement) of bubbly, so you end up doing a bit of a clown getup on your own person. Chelsy looked scrag-tacular! And I can't believe I was surprised by Fergie's girls - you'd think after the shockers of the past I would have expected them to look awful, but they managed to make my jaw drop! They obviously weren't thinking at all!! Oh so cool to go to a fancy party! After ignoring the whole wedding thing all week, at the last minute I got an attack of the 'oh but this is history and we are missing it' and tuned in to watch with the kids while tweeting.... and oh how funny my twitter stream was! Made me wish I was at a party with all my twitter friends.. would have been awesome! I love that you all frocked up for the occassion. CRAP Dadda and I celebrated as well - he drooled and snored on the lounge through the ceremony then I fell asleep after the ceremony and BEFORE the kiss. I woke up cursing myself - it was like listening to a joke and not hearing the punchline!! BTW you guys do scrub up well!! The kiss was overrated - it was always going to be! The station we watched stopped the coverage as soon as they went back inside so we missed the Aston Martin drive. Map Guy would have watched three days of pomp and crap to see that Aston. I wanted to check my twitter feed - how sad is that!! What a bunch of scrags those Princesses and Chelsea are! Money really can't buy class, style or taste can it? Imagine what the Queen was thinking!! Hell yeah. Just cos it's got a label on it, doesn't mean you won't look like you've got the Flying Spaghetti Monster on your head! How much fun to get all dressed up! I'm a republican also, but still watched and loved it with the kids. We had an English High Tea to celebrate, including Yorkshire puds. Great minds think alike! Asking questions are truly nice thing if you are not understanding anything entirely, however this post provides nice understanding even. world-wide-web I found this web site as a best website for latest updates. I don't even know how I stopped up right here, however I thought this post was once great. I do not understand who you are however definitely you are going to a famous blogger in the event you are not already. Cheers!